Three days of six-string heaven in north Donegal. In this our second year we are delighted to present a broad spectrum of musical styles on acoustic and electric guitars performed by some of the foremost pickers in the world today. This year features the amazing, and highly entertaining Thom Bresh from the U.S. who is the son of the legendary Merle Travis. 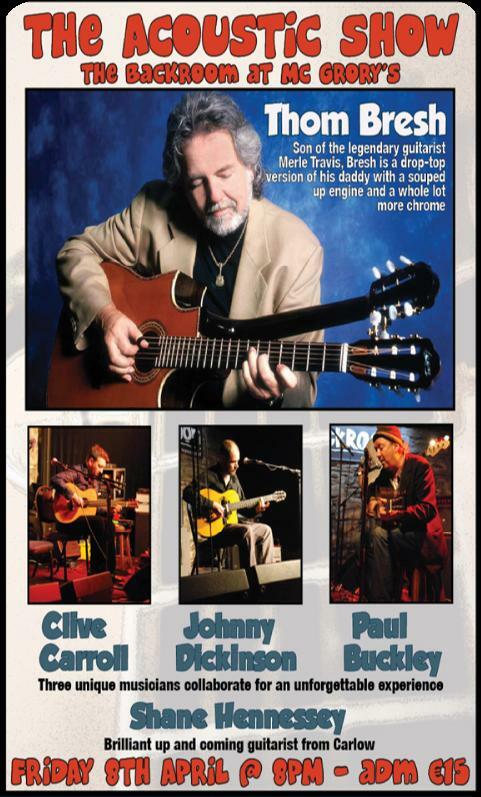 Once again this year we have the acoustic blues and folk from slide guru Johnny Dickinson and also once again the exquisite Celtic tinged fingerstyle of Clive Carroll and this time round they will be joined by the Ramelton based, Paul Buckley. No guitar festival in these parts would be complete without our own hero of Woodstock, Henry McCullough, and this year we have a special treat as Henry joins Thom Bresh to guest with The Ted Ponsonby All Stars for a special showon Saturday 9th. Arty McGlynn’s Jazz Combo will also appear this year as will the Dublin based Cosmopolitan Guitar Quartet which features the playing of Dave Flynn, Hugh Buckley, John Feeley and African guitarist Niwel Tsumbu. The amazing thirteen year old jazz playing of Andreas Varaday also features. Singer songwriter Nick Harper makes a special appearance with support from Una Mc Cann and Ciara Butcher with a first time guitar festival appearance of up and coming guitar genius Shane Hennessy.We extend the warmest welcome to folks of all ages to enjoy a fun filled weekend in one of the most beautiful locations in Ireland.